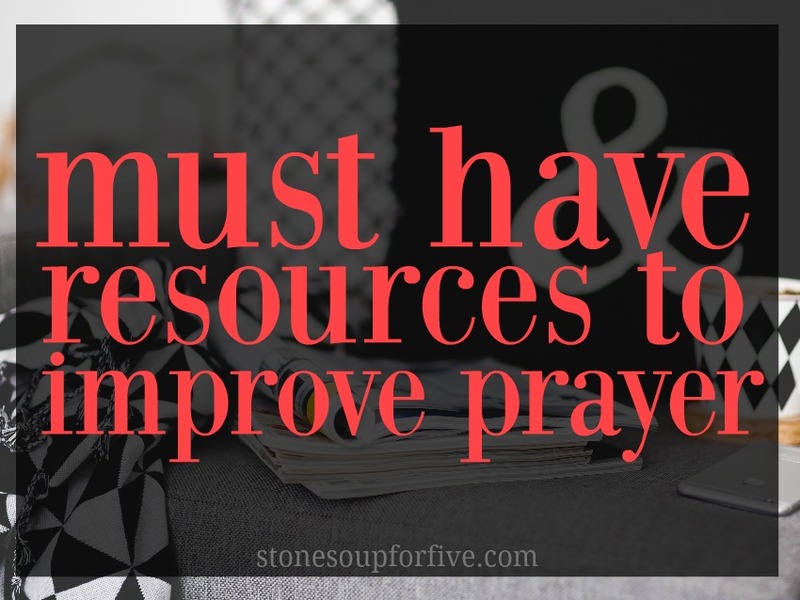 Stone Soup for Five: Must have resources for improving your prayer life! Must have resources for improving your prayer life! It was a great time, with just a few mistakes on my part, but they all worked out. I asked Michele to go over her Prayer Notebook in a lot of detail because I know it's always frustrating for me to see someone gloss over their notebook when I want to know EXACTLY HOW they set it up since I'm such a hands-on learner! The Hour that Changes the World--very specific and great to those new to prayer. A Watchman's Guide to Praying God's Promises--free when you sign up for their mailing list. A Woman After God's Own Heart--Elizabeth George is a wonderful, sweet "mentor" I had when we were first married and this book changed my life. She is specific, clear, and firm yet gentle. Her chapter on prayer in this book is wonderful, along with the rest of the book! The Valley of Vision--Puritan prayers that are just beautiful and inspiring. Prone to Wander--Great prayers of confession and assurance. Voices from the Past--Insightful and relevant writings to encourage and inspire faith and prayer. Penny Bennett Totes--Handmade Bible sized bags that both Michele and I LOVE. High quality and meticulously made by Penny. A worthy investment that will last a lifetime. I'd love to get feedback on what you think and other types of coffee chats you'd like to see! Just wanted to add...I do your Doodle Studies, Love Jesus, drink lots of coffee, and am a total dork! I love, love, loved the chat! What's funny is about a month ago, before I saw this, or the post by Intentional by grace, I had the idea to use the bullet journal format for my prayer journal, and I began working on it, and it had already changed my prayer life so much, but there was a few things I was struggling with not sure how to fit in, and ya'lls video helped me to figure it out! I LOVE it! Thanks so much for sharing!!! Thanks so much for including your Penny Bennett Totes in the chat. That was a delightful surprise and I'm thrilled to hear that your Bible Totes are serving you well. God bless you both for your commitment to getting THE WORD out and teaching others the power of studying God's Word for YOURSELF. Amazing!! Thank you so much for sharing this! I have never been able to make a prayer binder work for me. I got too overwhelmed flipping to try to find what I was looking for. I think this prayer journal might work for me. I have really enjoyed everything Kari and Michelle have brought up. I watched the video and took lots of notes, added to my prayer journal, and saved information. I actually started this journal last year when I started buying Kari's doodle studies. I had put all of the doodling tutorials in the front, then after going through Intentional By Grace, I started my index, on page 51! After watching the chat I added more pages and have a lot of pages left. It's definitely a hodgepodge of prayers, bible studies and everything else that I find that moves me spiritually. Thank you both for sharing! I have begun using Michele's prayer journal and I am finding that it is wonderful to use. I like the bound journal and have gotten over my need for "perfection", just like Michele said. The first time that I made a mistake, I gasped and thought, "Oh no. Now I have ruined it!" Then I chuckled and kept going. I am happily filling up my journal. Much of which is transferring things from one spiral notebook or another. My husband likes to write in my spiral notebooks. He respects my journal. We have mutual prayer times and I don't have anything that he doesn't know, so him reading my prayer journal is not an issue. It has been a blessing. I started one for my grown daughter- with the outline from Michele and the Charles Spurgeon quote. I put in a few things that I knew that would be helpful to my daughter. I send her prayers and quotes that I know she would like and she has been copying them in. She is now off and running with the concept, on her own and says that she likes it too. She chuckled when she read some of the prayers that I say for her. She said, "Thanks, Mom. This is nice to see what you are praying for me." I had a pregnancy journal and that had prayers for the three of us. Those are treasured memories now. I hope that this journal will continue to be a blessing. I love it so far. Thank you for our coffee chat. I really got a lot out of it! I went to the Pinterest page, but I'm trying to find a link for Michele's Spurgeon quote.